UI5ers Buzz #17: Support Assistant – Keep your UI5 Apps in Good Shape! Have you ever imagined a world in which your SAPUI5/OpenUI5 dev/test environment will help you fix UI issues before they are even discovered? Well, this is not fiction anymore. 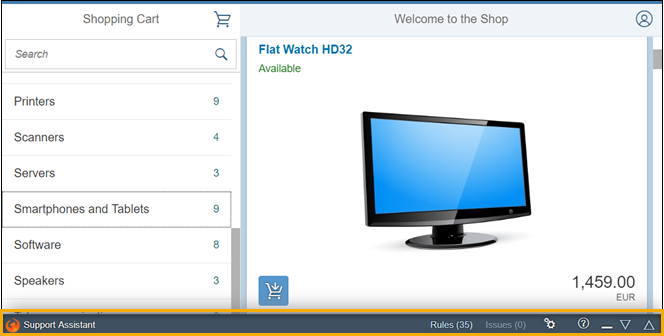 With the UI5 Support Assistant you can easily and efficiently check whether your apps are following the UI5 best practices, product standard requirements or SAP Fiori Design Guidelines. SAPUI5 is the strategic technology to move towards appealing and standard-compliant web designs and Fiori apps, based on this UI5 framework, have become the mainstream for S/4 HANA. However, with experience we’ve come to realize that the guidelines and best practices, although documented, are not widely known or followed by all stakeholders and development teams. Also, it is a familiar fact that consultation tickets, software bugs or performance issues are often more costly and difficult to resolve when discovered late. So, we started thinking how we can ensure that guidelines are being followed correctly and at the same time help speed up the development process and reduce costs. In other words, how we can make life easier. The solution was the development and release of the latest support tool – the Support Assistant, which became available as of SAPUI5/OpenUI5 version 1.48. It is embedded in the SAPUI5 framework and allows you to check directly in the browser runtime whether an existing or newly developed Fiori or freestyle app follows UI5 best practices, product standard requirements or SAP Fiori Design Guidelines. The tool is easy to start. You can either use the URL parameter sap-ui-support=true or open it from the Technical Information Dialog using the key combination ALT+CTRL+SHFT+P. You can find more information in the Support Assistant Documentation. You are probably wondering if you need to be using a new SAPUI5 version to be able to take advantage of this tool. The answer is: No. The Support Assistant is designed to run in a separate instance side-by-side with the UI5 app and to appear in a separate frame, so it can be used to analyze any SAPUI5-based application down to version 1.44.17. So, how exactly does the Support Assistant work? It helps you reveal potential issues and ensure best practices and design guidelines are followed. It can automatically check for specific re-occurring or expected UI issues and suggest on-the-spot solutions and documentation links. It helps to lower development and maintenance cost for SAP internally and for customers. It makes the development process faster and more efficient by providing help and support at the right time. Stay tuned for more posts about the Support Assistant in which we’ll give you more information about the support rules and about specific features of the tool. The next post of our UI5ers Buzz blog series will cover “Useful Tools for developing UI5 with WebStorm”. How are we doing? Let us know by leaving a comment here or contacting us in the slack channel. Thanks for the info Daniel. It’s great that the tool supports versions down to 1.44, as that is the stable/maintenance release for the ‘Fiori 2’ design. I tried with the url parameter too and the result was the same. Yes, the Support Assistant should be functional after 1.44.17 and is also tested / working with FLP. In fact – with any SAPUI5-based application. Would you open browser’s dev tools (F12) and observe in the Network/Console logs for errors? Same here. And workaround from below makes no difference.. 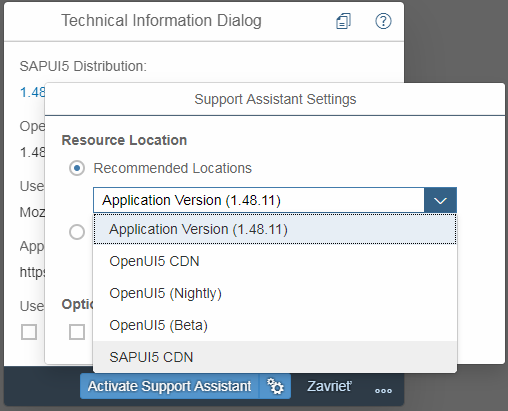 I found the solution for my problem, when you press Ctrl + Shift + Alt + P, and you are using resource from CDN, in dialog you have to go to settings, and from Reccomended locations choose SAPUI5 CDN, and then click Activate Support Assistant. Notice also options setting to open SA in new window. Just started using it. Pretty cool. Let’s see where it goes from here! thank you for the interest exploring it – would be glad to know your feedback. As for deactivation – there is no such feature currently, but your question had triggered me, so we would consider it in future.